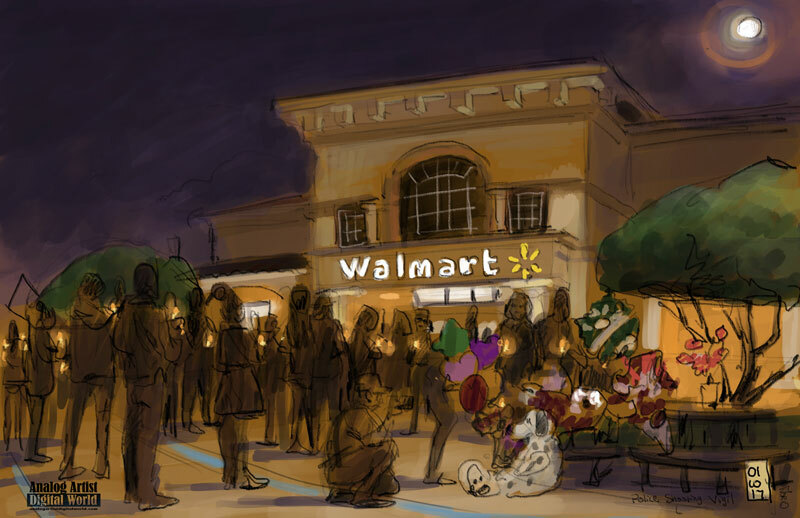 Analog Artist Digital World: Candlelight vigil at Walmart. I went to a candlelight vigil at Walmart Supercenter, (3101 Princeton Street, Princeton, Orlando, FL). The vigil was in memory of Master Sergeant Debora Clayton, and Deputy Norm Lewis. Clayton was shot by Markeith Loyd, 41, while in pursuit. The shooter was a suspect in the murder of pregnant mother Sade Dixon who was believed to be killed by her ex-boyfriend. Clayton was shot after she spotted the suspect outside the Walmart on Princeton Street around 7:15 a.m. Monday. She was among the first wave of officers who responded on the evening of June 12th at the Pulse nightclub shoot in which 49 people lost the or lives. After shooting Clayton, authorities said Loyd fled toward the Pine Hills neighborhood, where he fired shots at a deputy’s cruiser and carjacked a vehicle. Orange County Sheriff's Deputy Norman Lewis, an 11-year veteran, was killed in a crash as authorities gave pursuit. Markeith Loyd was still eluding capture on the day of the vigil. The reward is being raised from $60,000 to $100,000 for information leading to the arrest of Loyd. As I walked towards the vigil, two police cruisers were parked in front of the Walmart entrance. A makeshift memorial was set up with live flowers, Mylar helium balloons and a large stuffed plush dalmatian. Photographers shot photos of the memorial and the small crowd lit candles. Votive candles were left burning curbside at the memorial. Loud motorcycles rode into the parking lot. I thought a biker gang had stopped to pay their respects, but the bikes were parked and the biker gang went inside to shop. I heard a metallic bang to my right as I sketched. Some careless driver had backed up into one of the motorcycles. The driver paused for a moment like a deer in the headlights when he realized there were police everywhere. Then he drove away. A mourner pursued a bit on foot trying to read the license plate. He only caught the first three digits. When the biker came out of Walmart an officer apologized. The hit and run driver had gotten away. The bike wasn't knocked over, so the damage must have been minimal. Cowards flee, believing they protected their boundaries.